Reviews of the Canon PowerShot SX200 IS from around the web. 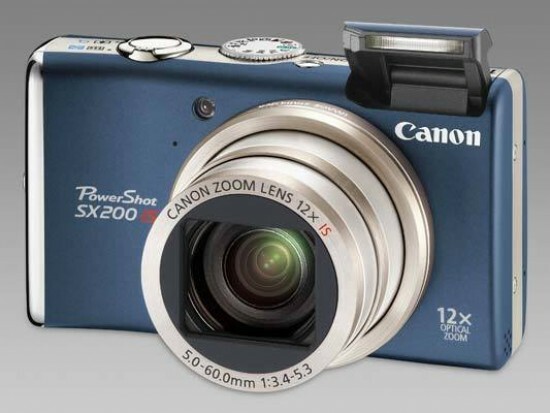 Canon’s PowerShot SX200 IS is a 12.1 Megapixel compact with a 12x optically stabilised zoom and a 3in screen. Announced in February 2009, it’s Canon’s first attempt at a pocket super-zoom and directly targets Panasonic’s enormously popular travel-zoom series. Like Panasonic’s latest Lumix TZ7 / ZS3, the PowerShot SX200 IS packs an impressive 12x optical zoom range into a relatively pocketable form factor, while keeping up with the latest gadgets and features. The Canon PowerShot SX200 IS ($349) is a compact ultra zoom camera with a 12X wide-angle zoom lens, image stabilization, full manual controls, HD video recording, and a 3-inch LCD display. That sounds an awful lot like Panasonic's ultra-popular Lumix DMC-TZ5 -- easily the best camera in this class in 2008 -- though that camera is soon to be replaced with the even more impressive DMC-ZS3 (also known as the TZ7). Regardless, the SX200 is a pretty nice step-up from the SX110 that came before it. Up until about 18 months ago, if you wanted a pocket-sized compact camera with a decent zoom range, you had a simple choice; either a Ricoh R-series or a Panasonic Lumix TZ-series. The latter especially proved to be very popular, particularly the excellent TZ5, helping to place Panasonic at the top of the compact camera market and prompting several other manufacturers to try and get in on the "travel camera" action. Canon's first attempt was the PowerShot SX100 IS, followed last Autumn by the SX110 IS, both of which had all the right features and an affordable price tag, but lacked the TZ5's compact shape and robust build quality. Other rivals include the Olympus mju 9000. Canon did a good job selecting the features to put in this digital camera, giving a very flexible zoom range and a complete set of manual controls while avoiding the least used features such as a viewfinder and hot-shoe. Since the majority of consumers do not use those features, it is very reasonable for Canon to remove them from budget models and keep them in more advanced models such as the Canon Powershot SX20 IS.